I had a new customer contact me and ask if I could create this design for her school’s annual fundraiser. It turned out great and I added it to my Etsy shop! Matching tickets coming soon! I created the layout and design of the 2017 summer edition of the Explorer. The Explorer magazine is printed twice yearly and is mailed to alumni and friends of the School of Dentistry. This edition featured highlights from the annual dental conference, alumni updates and events, and student and faculty news. Click here to view a PDF of the Explorer 2017. I’ve been working on some holiday designs in my Etsy shop! Recently I completed a self-promotion brochure for Dr. White. Dr. White is running for office within the Academy of General Dentistry. I created a traditional 3-panel brochure for her to hand out at the event. I also created a pdf file for her to email to voters before the annual conference. The pdf actually contains an additional page. This extra page allowed us to include all of Dr. White’s recommendations from colleagues (she had a lot!). The Explorer magazine is published twice yearly by the UMKC School of Dentistry. I created this “infographic” for the cover. Infographics (or information graphics) are visual representations of information. It’s a fun way to present information quickly and clearly. Images is an annual photo contest held at the School of Dentistry. Students, staff and faculty submit their favorite photos and the winners are chosen to be on a poster calendar. This is the calendar I created for 2016. Happy New Year! 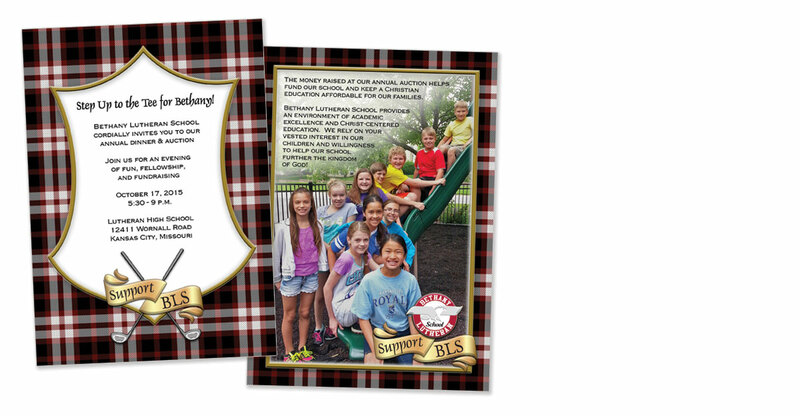 Yesterday I finished up the invitation for Bethany Lutheran School’s annual auction. This year’s theme is: Step Up to the Tee for Bethany! It will be a great time, contact me for more information! 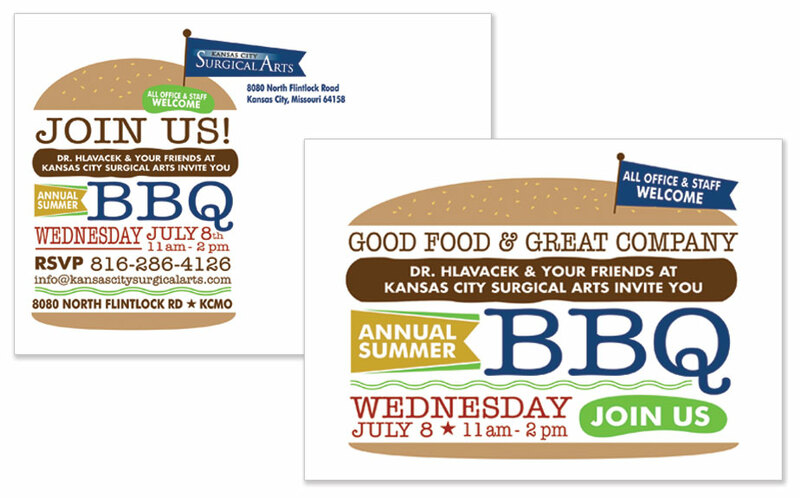 Kansas City Surgical Arts holds an annual summer BBQ! This year we did a hamburger-style invite and evite. A traditional postcard was printed and mailed, a week or so before an evite reminder was emailed. Take a look at our fun design!